Periphery guitarist Mark Holcomb has once again joined forces with PRS to create this epic instrument, the PRS 2017 SE Mark Holcomb Electric Guitar. 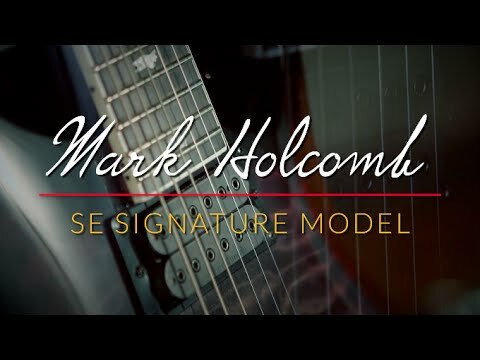 The complex rhythms and soaring melodies that Holcomb performs required a guitar with superior woods, signature pickups and solid hardware, and the 2017 SE Mark Holcomb delivers without compromise. The 2017 SE Mark Holcomb is crafted utilising the revered combination of a mahogany back and beveled maple top finished in a sumptuous quilted maple veneer that not only looks beautiful but also helps to deliver a rich, complex tone. The 3-piece maple neck of the 2017 SE Mark Holcomb combines a stain finish with a wide-thin profile that will allow you to fly up and down the frets with incredible glide. This is topped off with an ebony fingerboard complete with white binding and bird position inlays amidst the 24 frets. To get the balance of sound that Mark required, he worked with Seymour Duncan to create his signature Alpha and Omega pickups. Together these epic pickups have every tonal requirement to deliver energetic solo's with tons of punch, and juicy, rich rhythm tone that remains precise. In addition to this the 2017 SE Mark Holcomb comes with a plate style bridge and PRS designed tuners that combine to offer unshakable tuning and stunning intonation making this guitar an absolute players dream.